Visit the Great Lakes & Georgian Bay Cruise from August 18-25, 2018 (Chicago to Midland/Toronto) and August 25-September 1, 2018 (Toronto/Midland to Chicago). The Great Lakes region is one of the most spectacular waterways in the world. With breathtaking island views and beautiful clear waters, the Great Lakes are also host to many interesting ports, charming towns and picturesque villages. 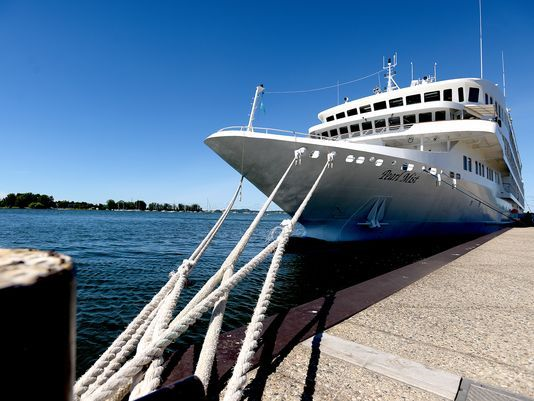 On this cruise, you'll explore the very best Canadian and U.S. ports on the Lakes during August, the ideal month to cruise the area. Discover what makes the Great Lakes one of the most visited areas in the North America. Tours noted in the city descriptions below may be at an additional cost. Chicago is the third largest city in the United States, located at the southwestern tip of Lake Michigan. With its many attractions it attracts 33 million visitors a year. One can find upscale shopping along the Magnificent Mile. The 3,000 foot long Navy Pier is home to retail shops, restaurants, museums, exhibition halls, and auditoriums. Other museums and galleries in Chicago include The Museum of Science and Industry, The Oriental Institute (part of the University of Chicago, with an extensive collection of Egyptian and Near Eastern artifacts), The Chicago History Museum, and Hyde Park Art Center—among many, many more. Chicago is also a sports town, named best sports city in the United States by The Sporting News in 2006. It is also well known for its gritty urban blues music. The European flavor of Holland, Michigan stems from its roots as a haven for Dutch immigrants who arrived in the mid-1800's. Popular attractions such as DeZwaan, the only authentic Dutch windmill in the U.S.; the new Dutch Galleries at the Holland Museum, a world-class collection of 17th, 18th, and 19th century art, furniture and artifacts from the Netherlands; their internationally-known Tulip Time Festival; and more recently the Tulipanes Lationo Art and Film Festival, continue to bring acclaim to Holland. Muskegon boasts a rich history coupled with an inviting lakeshore culture. Referred to as “The Riviera of the Midwest,” Muskegon has grown from a fur trading and lumbering town to a vacationer’s paradise. The town preserves reminders of its industrious history through museums such as the USS Silversides Submarine Museum and the Muskegon Museum of Art. One of the most exciting landmarks in town is Heritage Landing, where the boardwalk hosts musical performances and dazzling fireworks shows. From historic ships and lighthouses to the restored mansions built by Muskegon’s most famous lumber barons, the history and scenery of this quaint Michigan town is nothing short of impressive. Located in the Straits of Mackinac, where the upper and lower peninsulas of Michigan meet, Mackinac Island is a living Victorian town. Personal motorized vehicles are prohibited—all those visiting or living on the island travel by horse or horse drawn carriage, bicycle, or walking. While Mackinac Island is known for its opulent Victorian homes and hotels it has had a long history. Anishinaabe-Ojibwe tradition holds that the island was a sacred place populated by the first people and was home to the Great Spirit Gitchie Manitou. Because of its location, it was a Native American gathering place. Since then it has been the site of French missionary churches, a center of the fur trade, and later, the fishing industry, before becoming dependent on tourism to fuel the local economy. Located at the mouth of Saint Mary's River, Sault Saint Marie was originally established by Jesuit missionaries in the 17th century. The rapid of Saint Mary's River connects Lake Superior to Lake Huron and have provided trade access between the United States and Canada for hundreds of years. The combination of the native Ojibwa with the French and English settlers paint a unique and diverse cultural portrait to visitors. Little Current is a community in the town of Northeastern Manitoulin and the Islands. The main town is on the northeast side of Manitoulin Island, a large island located at the northern end of Lake Huron and northwest of Georgian Bay. Manitoulin is the world's largest freshwater lake island. Little Current is known for its swining bridge, a one-lane bridge and the only vehicular access to Manitoulin Island except for a daily passenger-vehicle ferry that runs from late spring to October. Parry Sound is located on the eastern shore of Georgian Bay in Lake Huron. It is the world's deepest natural freshwater port. The body of water that gives the town its name was named after the Arctic explorer Sir William Edward Parry. The modern townsite was established in 1857 and in the late 19th century rail service reached Parry Sound making it an important depot along the rail lines to Western Canada. The town was important during the First and Second World Wars with its explosives and munitions factory. The birthplace of hockey legend, Bobby Orr, the town also is known for its annual sailing regatta and performing arts festival. Midland is the main town and economic center of the area located at the southern end of Lake Huron's Georgian Bay's 30,000 Islands. Points of interest in or near Midland include the Jesuit mission of Sainte-Marie among the Hurons, a living museum depicting 17th century missionary life. Also, one can visit the Huronia Museum and the adjacent Indian Village. For bird lovers, the Wye Marsh Wildlife Centre is a habitat for Trumpeter Swans, Black Terns, and Least Bitterns. By the harbor there is a large statue of the trumpeter swan, considered the symbol of Midland. Motor coach pickup is at 10 a.m. on departure day from the front lobby of the Fairmont Royal York in Toronto. We urge passengers to fly in the night before and stay at the Fairmont Royal York so they can make sure to be available for this transfer. Passengers who are unable to make the transfer from the Fairmont will be responsible for finding their own form of transportation to Midland. They must arrive at the ship before 1 p.m. The ride from Toronto to Midland is 2 hours. No sightseeing is included. Embarkation will begin around noon, and lunch will be served on board. The ship will depart at 3 p.m. The ship will arrive in Midland around 7 a.m. Buses will depart the ship at 8:30 a.m., and will arrive at the airport around 10:30 a.m. We urge passengers to book their flights in the afternoon so they can give themselves plenty of time to clear customs without rushing. There will be different buses for passengers going directly to the airport vs. those staying at local hotels.